Starbucks’ wildly popular Unicorn Frappucino craze came and went in late April. Although the concoction was laden with sugar — 59 grams for a grande, and 76 grams for venti — many stores could not fulfill orders by day three of the promotion. There remains much to glean from this five-day retail sensation. The aesthetic appeal of the product surely contributed to its viral status, making for vibrant pics on social media and happy faces in Starbucks coffee shops. Changing color and flavor while a person drank it, the Unicorn Frappuccino swirled together exciting colors of its mango syrup, sour blue drizzle, sweet powder, and vanilla whipped cream. In an Emerald Insight study titled “Impact of Color on Marketing,” researchers found that up to 90% of snap judgments made about products can be based on color alone, depending on the product. When it comes to marketing, how a product looks, or visually appeals, to customers can boost a product’s success in the marketplace. “Limited time” still works its magic. Creating a sense of urgency remains a fruitful marketing strategy, one that caused Starbucks more demand than they may have anticipated. An Alabama reporter cited that most locations had already sold out of the drink by April 21, two days prior to the end of the advertised promotion. An offshoot of this lesson is that while the “limited time” phrase can drive customers to the door, the “while supplies last” can be a measure worth checking twice when implementing a special promotion. Social media holds power to influence. 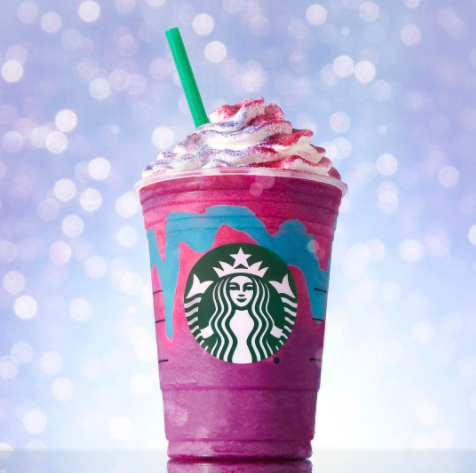 Despite meager market reports released shortly after Starbucks Unicorn week, former Starbucks CEO Howard Schultz referred to the Unicorn Frappuccino as "the most stunning example of our understanding of digital and social media and Instagram" that fueled significant traffic, incrementality, awareness, brand affinity. (Source: Investors Business Daily) Indeed, the name, visual appeal, and social media popularity alone delivered an appealing message to consumers: have fun, let it go, say ‘yes’ to the dress, take a trip, explore new heights, go on the adventure.